When history is written or narrated the name Mahabharata does strikes a bell. It's much grander than any living legend on earth. The epic continues to enthral the masses with the same flavour and fervour from ancient times. Author Anand Neelakantan in his new book "Ajaya: Epic of the Kaurava Clan" tries to lend a new perspective to the epic with a style of his own. So does it works? Let's find out. The book is set in the backdrop of India’s most powerful empire. A revolution is about to happen and Bhishma, finds himself struggling to maintain the unity of his empire. Dhritarashtra, is the reigning King with his foreign-born Queen, Gandhari. Kunti, the Dowager-Queen, meanwhile waits in the background to see her firstborn son become the rightful ruler of the kingdom. The other key characters in the book are Eklavya, Karna, Parashurama, Balarama, Jara, and Takshaka. Amidst, all the confusion and power struggle, Prince Suyodhana, the rightful heir to the throne stands tall, determined to claim the throne. Meanwhile, in the corridors of Hastinapur a plot to overthrow the present King and conquer India is brewing. Who ultimately gets to sit on the throne and be the most deserving King? First look at the title and the cover and the tagline suits the cover image. The title bearing the mark of history all over it. 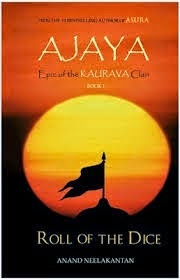 The cover image with a flag and a rising sun is a benchmark as to what one can expect from the book. The blurb talks about one of the most revered epics of all times and it's bearing on mankind. The blurb manages to keep away the all important facts of the book and thus, keeping the curiosity alive. The story is set in the times of Mahabharata when two clans clashed for power and survival. Kauravas and Pandavas were at helm of the prosperity of Bharat and their kingdom but not all was in their control. The outside interference and the inner frictions gave birth to a rivalry so dark that it affected one man looked at another in the years to come. The story is of brother in arms falling apart and becoming sworn enemies of each other. So who will survive the test of time and who will rise to the glory? What awaits both the clans and who will it by force or by con? That's what the story is all about. The story set in the epic times refreshes your memories and reminds of the good old days when it was all about power and brotherhood and enemies. The story unfurls in a different style keeping Kauravas at the helm and Pandavas in the backdrop. It has been manoeuvred with craft and skill and there's a clear mandate to make it not obvious for the readers. The introduction of new characters infuses new life to the story as the newbies play a pivotal role in shaping up the core of the book and its context to the history. The narration is a mix of lucid and some deep diggings of those times. The downside of the book is it's failure to capture the exact emotions of Kauravas and the role reversal is only effective for a short period of time. The new characters look good but then there's no fixed part to play after a certain period of time in the story. The Kauravas v/s Pandavas still remains the same as there is not much to savour when it comes to newness and freshness in the storyline. The book should have been cut down a bit to keep the sanctity alive as it tends to over exaggerate at times. All in all it's not the perfect served book to the readers. There are times of hurrah and times of sigh too. It's a travel down to the memory lane reliving the epic in a grand style. But then the book doesn't sheds limelight as to what exact purpose it wants to solve by retelling the tale. There are good and bad moments but more stress could have been given in creating the perfect atmosphere for historical fiction buffs. The book is a mixed affair.